Single tile docks (i.e. ones with no piers extending into the water) can be connected together up a slope. Is this a bug or a feature? Should this be fixed? Or has this flaw already mastered the transition from bug to feature? I always like it, when recent bug reports reveal ancient bugs. Is this in any way useful, or does it only allow ugly constructions? I think it was shortly introduced after rivers, although the check for a nearby river seems to be not really executed. But without this, having extensive harbour near rivers were difficult. But since now lakes return water too, how about putting the restriction "next to water" back in. The check was missing for 1x1 docks. 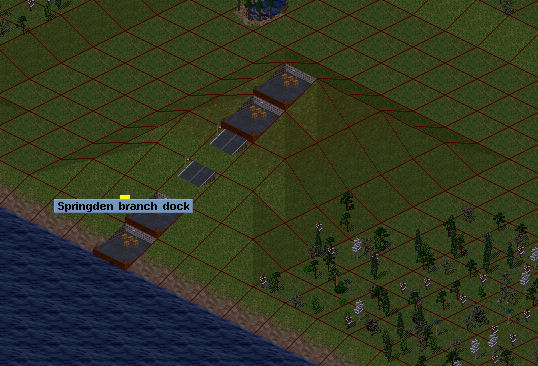 I added an extra check requiring water or water ways in front of such docks.